2018 kicked off with an immense interest in token-powered platforms and services, with sales of tokens generating more than $4 billion just in the first quarter. Public interest in Initial Coin Offerings is increasing rapidly, — as is the attention and scrutiny paid to scammers, untrustworthy companies, and faulty token models. How risky are the ICOs? Unfortunately, startups with obscure whitepapers and non-viable business models still manage to get support from prestigious partners and lots of hype from their bounty programs. When news of their funding breaks, people are quick to roll their eyes and predict failure. And then, yes, almost half of them fail spectacularly. The graveyard of ICOs is littered with dead tokens, and they’re continuing to pile up at accelerated rate. Those who were shrewd enough to predict the failure had no way to act on, and benefit from, that knowledge. The ICO token market is inefficient but it isn’t exploitable. There is no way to make a profit just by predicting that a startup has a bad business model and that their tokens cost more than they should. A typical ICO token sale process lacks a certain type and direction of liquidity: you can’t short sell the newly issues tokens as they are not traded on any exchanges. Despite the risks posed by ICOs, we still believe that ICOs play an important role in accelerating innovation and can provide immense value in the future. The hope is not lost. The knowledge about scams and risky ICOs is out there, but until now there hasn’t been a way to act on it (and benefit). Do you already know that an ICO is too risky? Did you read the whitepaper and realised that the token-based service will never take off? Now you can make money from that. We value transparency in the blockchain space, and we want to contribute to the promotion of token-powered economic growth and consumer protection. To that end, we’ve created a platform that gathers the wisdom of the crowd to provide better insight into token value (— and ICO success). Through our platform, we’ve provided a market for you to make use of your insights about how startups will perform in their ICOs. Our ICO prediction market category is designed to inform investors, consumers, and regulators about important aspects of token projects. Available markets can range from the technical feasibility of the project and its roadmap to the fairness of token prices or even the trustworthiness and regulatory compliance of projects. “Will the average price of token X drop by Y% after a specified period?”, and so on. Token sales are inefficient and lack a certain type and direction of liquidity: you can’t short sell the newly issues tokens. Are you ready to put your insights and intuition to work? Then PredictionMarkt is ready for you. We believe that prediction markets will be an important tool for the blockchain space, and we can’t wait to hear your feedback about the service. Please reach out our telegram group or via [email protected] if you have any questions, comments, or feedback. This post will guide you through 3 simple steps of buying shares in a prediction market. If you are new to prediction markets, you can read how prediction markets work first. First, create an account and deposit a bit of ETH you want to trade with. Find the market category you are interested in. There are a few prediction market categories to choose from. 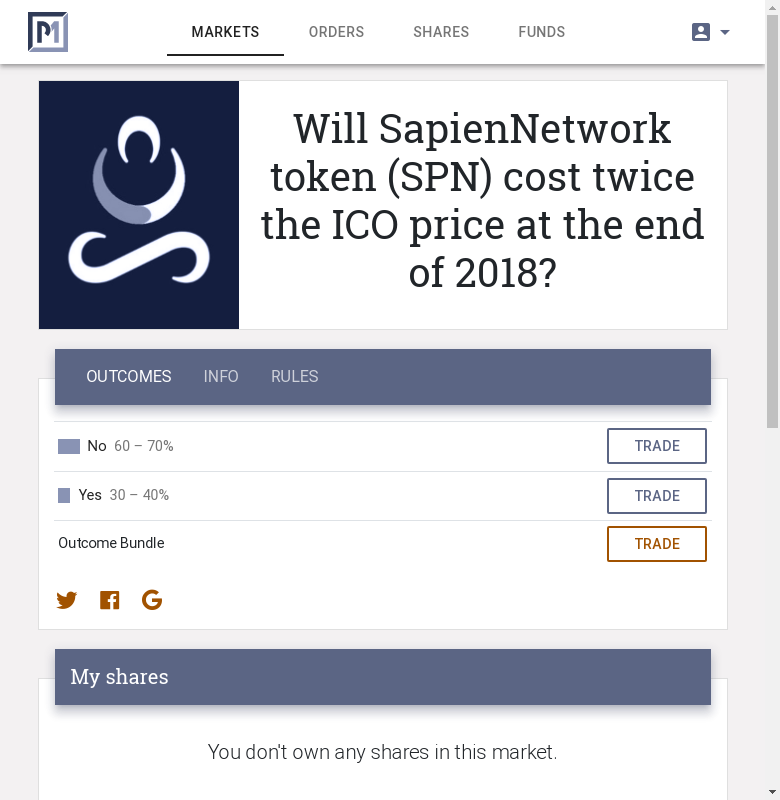 Let’s take a look at the prediction market for SapienNetwork token, from the prediction markets for initial coin offerings. Normally the token being sold during the ICO is not openly tradeable, not everybody can participate in the crowd sale and it is not possible to short-sell the token (bet against the token price growth) before it gets listed on the exchanges. 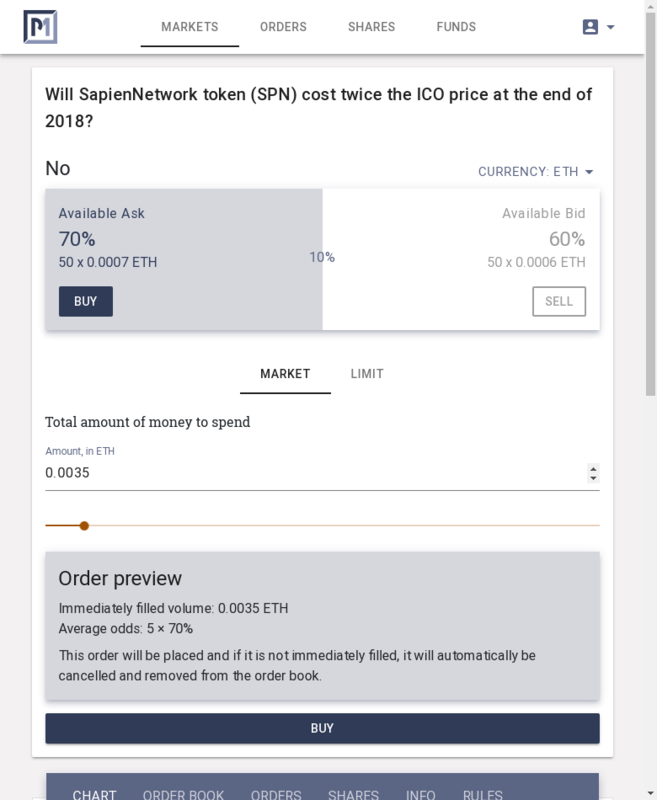 The crowd is ~70% confident that the SPN token price won't grow and it looks like the ICO might be risky. Purchase the fixed-price "Outcome Bundle" at 100% of the price, getting both "Yes" and "No" shares, then sell "Yes" shares immediately. If you are right, in both cases you will end up with "No" shares, which will be liquidated at 100% of the price when the market settles. You can see that the crowd is asking 70% price for the “No” shares. If you buy “No” shares for that price, you will get the other 30% when the token price drops in 3 months. Worth a shot! Now you own the "No" shares. 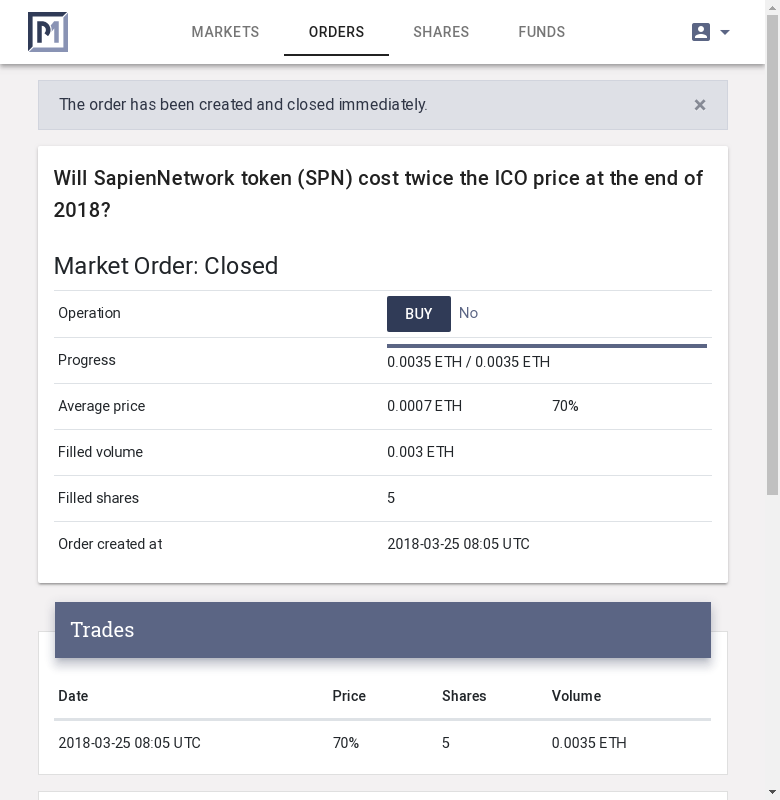 You can sell them or trade them without waiting for the outcome of the events, otherwise the share will automatically convert to 100% if your prediction is correct. We just went through a simple trading example and PredictionMarkt enables you to utilise more powerful prediction trading strategies. We are always ready to help and we can’t wait to hear your feedback about the service. Please reach out our telegram group if you have any questions!